You are invited to join Christopher or Jeannie to experience a Daily Morning Practice that is efficient, effective, and exquisite. This efficient and fun morning practice is absolutely perfect for ALL abilities with a 20 min whole body warm up (a mini yoga class), a breathing practice, an effortless meditation that everyone can do, and a short rest at the end. This Radiant Living Daily Practice is our own personal practice that gets our whole body mind and soul ‘online’ and ‘aligned’, which prepares us best to be present with our families, ourselves, and with whatever arises spontaneously in the ‘Living Moments of Life’. This practice is also a great warm up for the full yoga classes that follow this new daily offering. We are so excited to share our morning practice with You! All are welcomed. This class is included in your membership, and tuition for non-members is simply what is honest & in integrity for you. 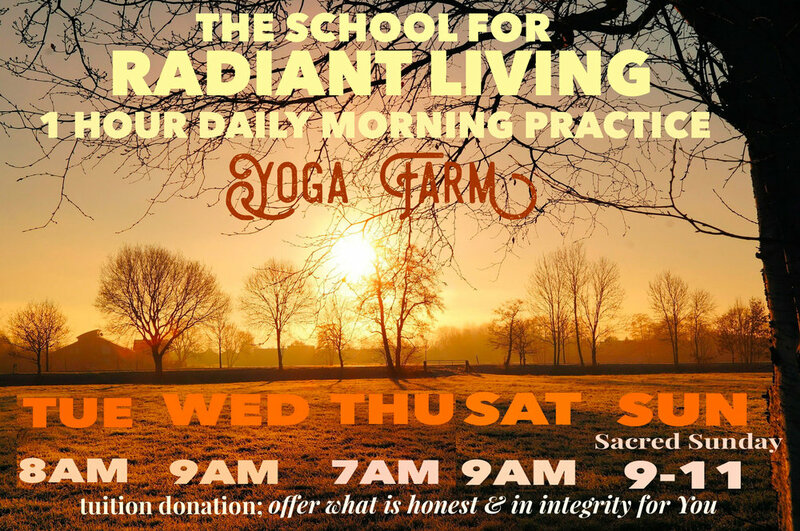 As a non profit organization, School For Radiant Living at Yoga Farm is dedicated to offer as much as possible to be affordable for everyone. This is Education for a United Humanity. We so look forward to greet You.